Ready to begin your journey to bliss? Through interactive exercises and stories from those who have been there, Bogus Balance will get you moving on the path to a fulfilling, peaceful, blissful life. Bogus Balance is available in paperback or as an e-book. To get more information, read some reviews and purchase a copy, you can head over to our page on Amazon or barnesandnoble.com now or check out the iBooks store. When it comes to Deirdre, there’s one thing you can count on. She tells it like it is. Her books are no different. In addition to Bogus Balance, Deirdre has used her personal brand of “mild audacity” to publish two other books. Tough Truths: The 10 Leadership Lessons We Don’t Talk About is Deirdre’s powerful mini-book, giving readers the straight scoop on what’s really behind those great leaders around us. The reason the lessons are truths is because they’re proven to make people great. The reason they are tough is because they make us uncomfortable. But, in the end, they won’t just lead to greatness. They’ll make us more satisfied than we’ve ever been before. 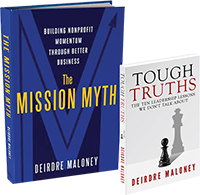 Deirdre’s first book, The Mission Myth, tells the story of her seven years running a multi-million dollar nonprofit organization. She got the job at 28 years old, made a ton of mistakes out of the gate, and spent the rest of the time figuring out how to transform the organization into an excellent, thriving business. This award-winning book is designed to validate, inspire and motivate anyone in the nonprofit sector to do good…well. Both are available in paperback and as e-books and can be found on Amazon, barnesandnoble.com and in the iBooks store.